Like a home away from home, the condominium units at Pend Oreille Shores Resort have all the conveniences and comforts you could ask for. 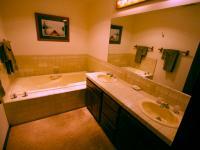 Each unit has a fully equipped kitchen, fireplace, washer and dryer, TV, DVD/VCR combo player, stereo and more! The one bedroom units comfortably sleep four with a queen size bed in the master bedroom and a queen size sleeper sofa (some units have full size sleeper sofas) in the living room. The two bedroom units will accommodate eight with a queen size bed in the master bedroom, a pair of twin beds in the second bedroom and two queen size sleeper sofas in the living room area. 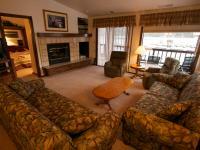 Whether you come for a romantic honeymoon or just to relax, Pend Oreille Shores is the perfect place! 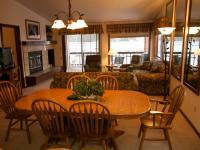 The units at Pend Oreille Shores are indeed fully furnished! This list will give you a general idea of the items available in each unit. Some units might have additional items, but hopefully, this list will help you know what to pack. Service for eight in one bedroom (for 12 in two bedroom) including serving platters and bowls. Pots and pans, cookie sheets, cake pans, roasters, casserole dishes, and mixing bowls with various spoons, potato mashers, ladles, graters and other kitchen conveniences. Miscellaneous items such as salt and pepper, hand dish soap, dishwashing soap for the dishwasher, SOS pads, paper towels, iron and ironing board, mop, broom, vacuum cleaner, cookbooks, scissors, laundry soap, placemats, napkins.